London, New York – October 13th 2014: Caplin Systems, e-distribution specialist and the pioneer of single-dealer platform (SDP) technology, today launches its new white paper, Trading On The Move, which evaluates the growing demand for mobile trading technology in the capital markets, discusses the challenges in delivering a reliable, secure, compliant mobile channel, and gives advice on how to approach building one. The paper draws on the results of a recent Caplin e-Trading survey, and highlights the disparity between buy-side enthusiasm for mobile trading and sell-side reservations. Supply and demand: There was clear demand for mobile execution from corporate clients - in fact, lack of service availability was the single biggest reason these clients weren’t trading on mobile devices, despite over 50% of the sell-side feeling lack of client demand was the main factor preventing them offering such a service. Execution and order placement are in high demand for FX trading, though only a small proportion of the sell-side are offering such services today. Security and compliance concerns were not a major factor for end-users, despite fears from the sell-side. In fact, only 8% of buy-side respondents named security as the primary reason for not using mobile trading, versus 57% of the sell side. These imbalances represent (short-term) opportunities for more forward thinking banks to stay competitive and leap-frog some of their slower competitors by extending their single-dealer platforms to include a mobile FX channel. 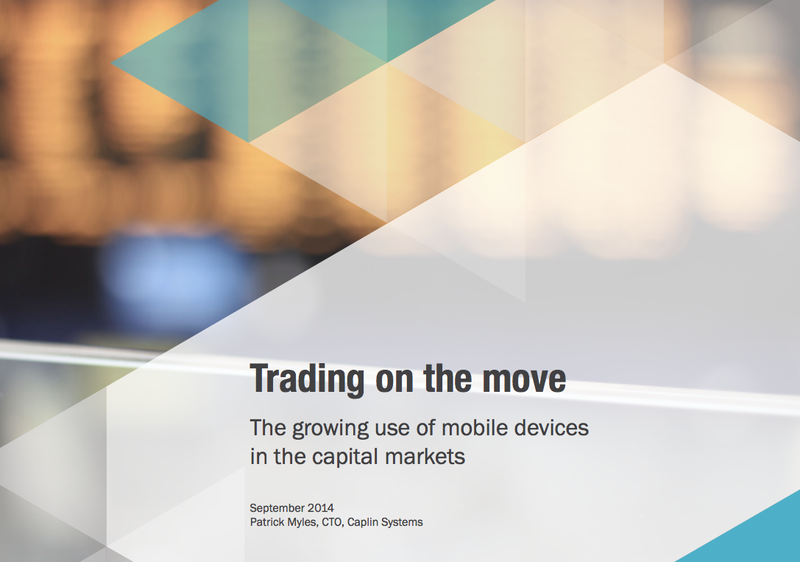 The white paper also includes the macro trends for mobile devices, advice on overcoming security concerns and the technical advice for building a mobile trading app. There were 150 respondents to the survey, which was carried out from April to July 2014. Of the sell-side participants, the majority (56%) were regional banks, followed by global banks (30%), the remainder being made up of smaller local firms. The buy-side was split between corporates (74%) and institutions/funds (26%). 72% of companies were based in the UK and Europe, 14% from the US and 14% from Asia.